How was your pre-order experience? Apple made iPhone X available to preorder at 12:01 a.m. Pacific today. Like many iPhone launches, it turned out a complete nightmare — and it left lot of fans feeling disappointed. Here’s how Twitter reacted to Apple’s biggest, most frustrating iPhone launch in years. What went wrong with iPhone X launch? 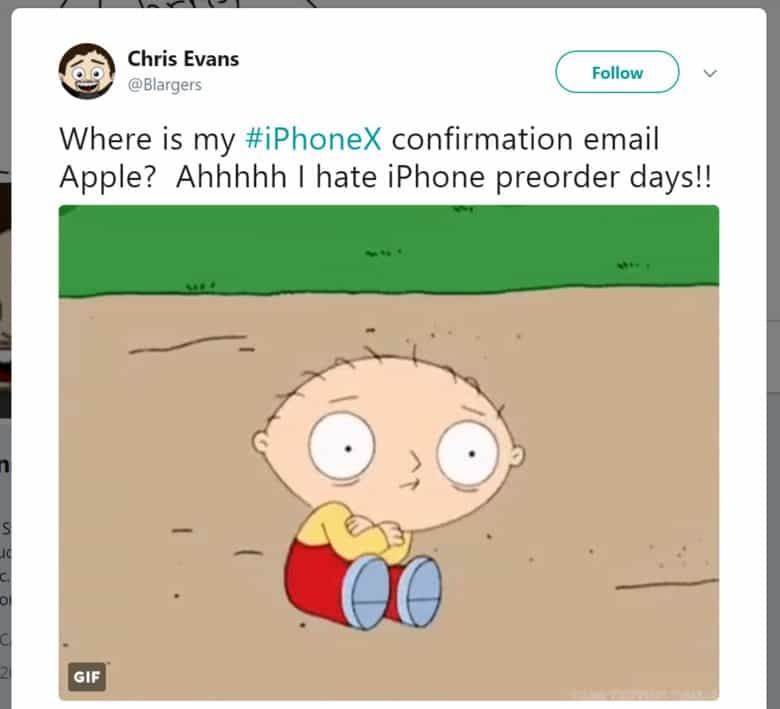 Preordering an iPhone X was a complete mess for me. I was fully prepared. I had already picked the model I wanted in the Apple Store app. I ensured my payment and shipping details were updated. And I got up early so that I was ready to go when preorders opened at 8:01 a.m. in the U.K. But for me, they didn’t open at 8:01 a.m. Both the Apple Store app and the online store remained down long after others claimed their shiny new handset. The app finally let me in around 8:08 a.m., at which point, shipping times for all models had slipped to two to three weeks. Others endured a similarly heartbreaking experience as the iPhone X launch turned into Apple’s most chaotic sellout in years. It’s not clear why it took so long for the store to appear for some customers. It’s certainly not that Apple prioritized certain markets, since I know a number of people in the U.K. — including Cult of Mac’s own Ste Smith — who were able to preorder before me. Others had access to the store and were able to start the preorder process, but were then pushed back by carrier activation. Anyone preordering an #iPhoneX get a reservation number with Apple saying they’ll email later to finish because they can’t reach carrier? It is believed Apple will have just 2 million to 3 million iPhone X units available at launch, which is why initial supplies will have sold out so quickly. That doesn’t explain why some customers could preorder before others, however. It also doesn’t explain why many carriers were ready to take preorders before Apple. Did carriers make a deal with Apple? Philip Berne has a theory on why carriers might be selling iPhone X first. Conspiracy theory time: For about 15 minutes the carriers were the only place to buy an iPhone X.
Apple essentially asked carriers to eat the iPhone 8, a phone designed to underwhelm. In return I suspect they gave some exclusivity. Some fans were still bemoaning iPhone X’s hefty price tag, a month after it was confirmed. I'm confused where should I put the delivery address for my 256 GB #iPhoneX, when I sell my home for it? Frustrated fans suggested some things Apple could do to ease the pain (you know, other than fixing its app and online store so that everyone gets a fair shot at placing a preorder). Of course, there were plenty of customers who were lucky enough to bag an iPhone X for launch day delivery on November 3. Secured my #iPhoneX for launch day delivery. This will be the longest week of my life. Did you preorder your iPhone X in time? Were you one of the lucky ones? Did you secure an iPhone X for November 3 delivery, or will you be waiting longer? Let us know your experience down in the comments!